The bye weeks are winding down, but the injuries are piling up. This is the most important stretch of the fantasy season so far. As each week goes by, we have new information that is presented to us and it requires careful consideration. You don’t have much time to reflect before you must turn the page to the following week. The first step in that transition is assessing which players are on the rise and which ones are falling in the fantasy rankings coming out of the weekend. Trubisky is a top-five fantasy quarterback through 10 weeks. Part of the success stems from his rushing production — he trails only Cam Newton at the position with 320 yards. He ran for a TD this week versus the Lions and added three more scores through the air to along with a career-high 355 passing yards. … In the two games since Freddie Kitchens has taken over as the Browns’ play caller, Mayfield has delivered top-10 fantasy production, including the best game of his young career as he was 17 of 20 for 216 yards and three touchdowns in Sunday’s win over Atlanta. … Don’t look now, but Mariota has posted 20-plus fantasy points two weeks in a row. With a favorable schedule ahead, he could be a fantasy asset down the stretch. Johnson totaled 100 yards of offense once in his first seven contests. Now he’s done it two games in a row. He took advantage of good matchup with the Chiefs racking up a season-best 183 total yards and delivered his second multiple-TD effort of 2018. … It is official, Jones has finally been unleashed as the Packers’ featured running back. He looks to be primed to be a RB1 option down the stretch after having 15 carries for 145 yards and a pair of touchdowns with two catches for 27 yards in Week 10. … The Jaguars showed no hesitancy in giving Fournette a full workload in his first game of action since Week 4. He touched the ball 29 times and delivered 109 total yards and two touchdowns against the Colts. … Seattle finally got a glimpse of what first-round pick Penny is capable of. With Chris Carson (hip) inactive, the rookie split time with Mike Davis and rushed for 108 yards and a TD on 12 carries. His 5.58 yards after contact per attempt was the third-best mark this week among qualifying running backs. 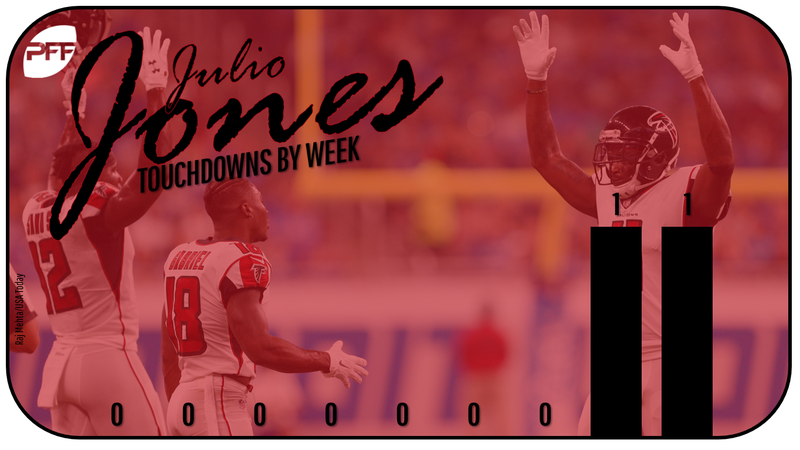 After going scoreless all season, Julio Jones found the end zone of the second straight week for the Falcons. He finished with his fourth straight 100-yard game in Week 10 as well and reached the 10,000-yard mark for his career in the loss to the Browns. … Both Robinson and Miller boasted big days against the banged-up Lions’ secondary. The duo combined for 11 catches for 255 yards and three touchdown catches. Robinson played his first complete game since Week 6 and turned in his best effort as a Bear. Meanwhile, Miller showed his big-play ability by putting up 20.3 yards per target. … Golladay was expected to see an uptick in targets with Golden Tate out of the picture. After it didn’t come to fruition in Week 9, he saw a season-high 12 targets as Detroit was trying to keep pace in their loss at Chicago. … With the injuries piling up in the Redskins’ passing game, Doctson has taken advantage of the opportunity as has now scored two weeks in a row after not finding the end zone in his first six contests of the season. Ebron caught two more touchdowns and rushed for an additional two-yard score in the Colts’ win over the Jaguars. He leads with all tight ends with nine receiving scores on the season. … After catching 10 more balls vs. the Browns, Hooper now sits behind only Zach Ertz, Travis Kelce, and George Kittle at the position with 46 receptions on the season. … Seals-Jones junior saw a season-high nine targets in Week 10 at Kansas City and has now been targeted 16 times over his last three contests. It was one of the uglier outings we’ve seen from Brady in Week 11 as the Patriots lost at Tennessee. Brady failed to throw a touchdown for the second time in three games. In five road games this year Brady has averaged 244.4 passing yards per with just six total touchdowns. … It was pretty ugly for Dalton without A.J. Green in Week 10’s loss to the Saints. Over his last three starts, Dalton has finished as QB27, QB11, and QB24. … Fitzpatrick became just the eighth player in NFL history to eclipse 400 yards passing without the benefit of throwing a touchdown. His three turnovers were costly on Sunday and if the trend continues another benching could be in his near future, making him a very risky start. The offensive line injuries may be too much for Peterson to overcome as evident by his pedestrian 2.11 yards after contact per attempt and dismal 30.1 elusive rating he posted in Week 10 versus a beleaguered Bucs’ defense. … The game flow seemed to be in Howard’s favor against the Lions, but it didn’t translate into fantasy success. He wound up having his most dismal rushing effort of the season (11/21/0). … Mack’s run of extraordinary matchups ended this past week against the Jaguars. He saw 14 touches but found very little room on his touches as he compiled just 0.27 PPR points per opportunity. … With Fournette working as the bell-cow runner in the Jaguars’ backfield, Hyde saw just nine snaps against the Colts and finished with three carries for five yards. He appears to be nothing more than a handcuff to Fournette at this point and offers little standalone value in redraft leagues. … Ekeler has disappeared over the past month in fantasy. 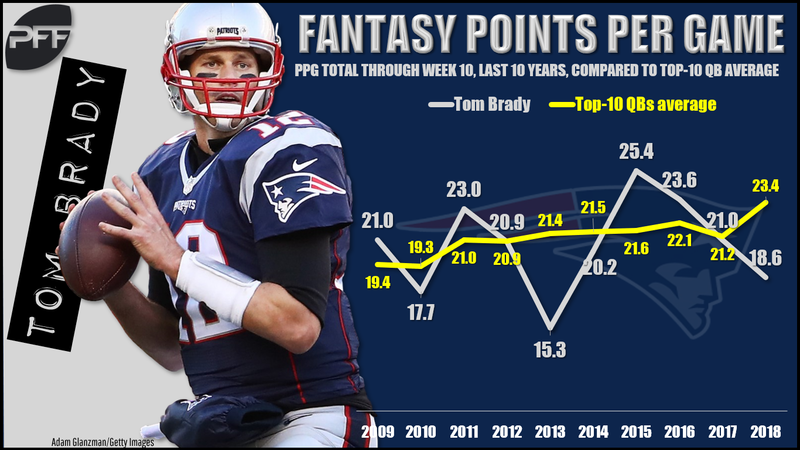 After scoring 12 or more PPR points in four his five outings, he’s only hit that mark once over his last four and has just 6.3 fantasy points total over his last two games. The volume is there for Landry, as only two players have seen more than the 94 targets that have come his way during his first season as Brown. The problem is he only has a 59% catch rate and 600 yards receiving (6.2 YPT). … Evans reminded owners of how low his floor can be of late. After exploding for a season-high 179 yards in Week 8, Evans has totaled just 67 yards over the past two games while pulling in just four catches on 14 targets. … It’s hard for owners to trust Funchess in their starting lineups. He’s only scored in three of his nine games and is still searching for his first 80-yard game of season. 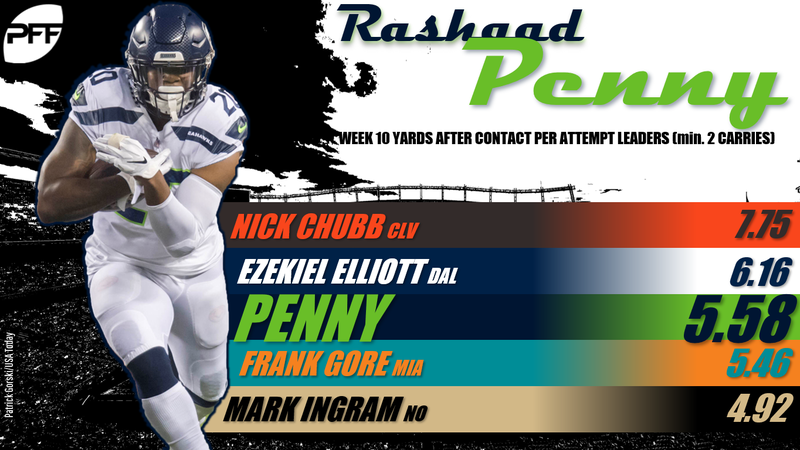 He finished with 32 yards in Week 10, marking his second-lowest output of 2018. For the fourth time in nine games and second time in the past three weeks Graham failed to reach double-digit fantasy points. Considering he has only scored twice all year the veteran the veteran is starting to lose his fantasy luster. … Doyle continues to see decent volume in the Colts’ passing game, but Ebron once again was the one scoring touchdowns as he had threes TD’s in Week 10 for Indianapolis despite Doyle playing 53 snaps to his 21 in the contest … A month ago the door looked wide open for Uzomah to take advantage of the injuries at the position for the Bengals to become a fantasy asset, but over his last three outings he’s only totaled a 5/36/1 cumulative stat line.